Dura-Pro™ Shock Elimination Technology!™ NO CLUB SHOCK! ... without bone-jaring shocks to wrists and elbows! that soaks up shock like a sponge! 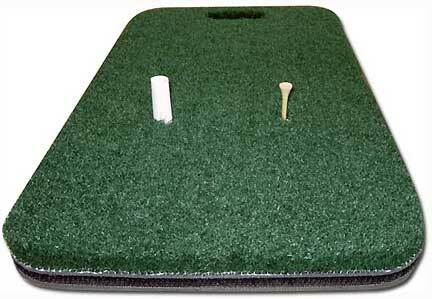 Includes 1 rubber tee and 1 Friction Tee (for your wood tee)! Made with durable, knitted nylon turf. The turf is thermally welded to the underlying mat. This welding process makes it nearly impossible for the turf to delaminate from the mat. Most other mats are glued instead of welded and are more prone to delamination. The High Tech Mat is made from a premium-grade of nylon that will not mar clubs because of its high melting-temperature. Revolutionary 3-D textile creates soft realistic feel. Many consumer mats are made with inexpensive Polypropylene turf. Polypropylene is much less durable than nylon and will mar the club-face. Finally, since the High Tech Mat's turf is knitted Pro Turf™, instead of woven, the turf fibres are firmly connected to the mat. Woven products tend to wear out quicker because fibres pull-out during use. The most exciting feature of the High Tech Mat is the middle, shock absorbing layer. This layer is composed of a light-weight, responsive material called a three-dimensional textile. The 3-D textile consists of thousands of vertical polyester "springs" that respond immediately to the impact of the golf club. The patented 3-D textile has an extremely open structure that allows air to escape during impact. The quick-response gives the High Tech Mat its soft, realistic feel. Available in a 1' x 2' portable size... take it to the range! Excellent product! This is the second one I have bought in 5years because it lasts so long!